Is virtue — in the Greco-Roman sense of the term — the sort of thing that can be taught? Short answers: no, though it’s complicated (Socrates). Yes, though it’s tough (the Stoics). Since the idea that virtue can be learned is central to Stoic teachings, and since the Stoics very clearly thought themselves as the intellectual heirs of Socrates, the issue deserves some further discussion. Socrates, after the usual lengthy discussion, concludes that virtue might be teachable in principle, but the fact that we don’t find any teachers of it (clearly not the Sophists, regardless of their self-serving advertising! ), then it must tentatively be concluded that the thing is likely not possible. But Aristotle famously disagreed with Socrates (and Plato), distinguishing between moral and intellectual virtue. Moral virtue is a matter of habit and disposition, i.e., it develops via a combination of natural inclination and conditioning — and it lays the foundation for what we call character. Intellectual virtue, however, can be taught directly. Bear with me (and with Curtler) because this distinction will soon yield fruits. Both Socrates and Plato had personal experience of the failure to teach moral virtue: the first one was clearly unable to influence his friend Alcibiades, one of the most fascinating figures of all Greek history; the second one almost lost his life in his attempt to educate the already vain and incorrigible Dionysius II of Syracuse. (Let me open a parenthesis about Dionysius II. He is featured in a classic story referred to as Damocles’ sword, which is somewhat relevant to the issue at hand. According to the story, which has arrived to us via Cicero, Damocles was flattering Dionysius, telling him how fortunate he was to be king. In order to teach him a lesson, the king invited Damocles to exchange place for a bit, a prospect that the latter eagerly embraced. But Dionysius had positioned a sword hanging right over the throne, secured only by a single hair from a horse’s tail. Damocles was then in constant fear of being suddenly killed. Apparently, he didn’t like the feeling, so he declined to be king any further, and was taught a good lesson on what it is like to live like a powerful man. Back to teaching (or not) virtue. Curtler correctly points out that modern psychology pretty much agrees with Aristotle: moral character is essentially formed by the time children begin formal schooling, or shortly thereafter, and it is likely a result of genetic, early developmental, and early environmental (including from family and siblings) influences. This would seem to lead to the conclusion that the notion of teaching virtue in school is a misguided one, in broad agreement with Socrates and against the Stoics. But wait, there is more. We are now ready for the transition from moral to intellectual virtue. While the basic structure of one’s character is laid out early on, one still grows up and begins to use reason to navigate complex moral situations, situations for which genetics and early conditioning by themselves simply do not prepare us. There will then be a gradual transition from moral to intellectual virtue, resulting in practical wisdom, one of the four cardinal Stoic virtues. More generally, the Stoics subscribed to a developmental theory of virtue, which seems very much to combine Aristotle’s early moral virtue with his mature intellectual virtue to shape a wholesome adult human being. Indeed, Curtler turns the table against the critics of education, suggesting that when they complain that education does not make people better persons they are confusing moral and intellectual virtue. The same criticism could be raised against Socrates’ pessimism (or Plato’s initial optimism about Dionysius II): in answering Meno he was thinking about moral virtue, and he is right that one cannot find formal teachers of it. But that only exhausts one dimension of virtue, and the other one can very much be affected by teachers, or by laudable examples about whom we read in literature and philosophy classes. Like the life and death of Socrates. This entry was posted in Virtue Ethics on March 3, 2016 by Massimo. Doubtless part of what we classify as virtue is hardwired in us in one way or another; after all, even animals like rats and vampire bats share food and recognize and punish free riders. However advances in social virtues of openness to those different from ourselves over the past decades also demonstrates that virtue must to some extent be learnable. (What we consider virtuous depends to some extent on learned sociocultural factors, and hence must be learnable). I think perhaps the best route towards teaching virtue can be found in those circumstances where we understand intellectually that something is virtuous but do not yet find ourselves reacting appropriately in given situations. It is much harder to convince someone that something is virtuous (e.g., treating those from group X fairly) when they cannot understand it as such even on an intellectual level. In that case it is perhaps impossible to convince through argument; the only way may be by repeated familiarization with the relevant facts (e.g., that people of group X are relevantly similar to your own group), and that may not be sufficient in many cases. One of the fundamental of questions of Plato’s Republic is whether or not justice and virtue should be pursued for its own end, but Aristotle’s way of teaching it, I feel, doesn’t agree with Plato’s answer. Using pleasure and discomfort to teach virtue seems a little strange because of the motives it create to fulfill a life of virtue. When a parent uses positive and negative reinforcement to teach virtue, will the child avoid unjust actions because they are unjust or because they will be punished? Similarly, will they undertake just goals because they are just or because of the praise they will receive? Obviously a parent cannot standby and let a child be completely alone in finding virtue but exactly, how should they teach their children to undertake a life of virtue for virtue itself? Teaching is one item, learning is another. You can teach anything, but it will not be learned bu the unwilling, or those who chose to violate the virtue for easy gain of any kind. It is interesting the Sanders and Clinton had this conversation of learning/achieving virtue, with regard to racism . IIRC, the former talked about changing hearts, and the other about changing laws. I suspect in the long run both are needed, and social change happens slowly, so slowly the events often overtake it. Virtue certainly can be taught, but if it is founded on mere pragmatic considerations, it cannot remain virtuous. Why not? Because pragmatism can also lead to evil as well as virtue! Mike, Great question! I think that to teach virtue for virtue sake depends upon the ontological existence of virtue – that virtue is not a human creation but has an independent existence apart from our own cognitions. Douglas, true. I was thinking about people like sociopaths, for which there is some genetic tendency. Now, like Massimo, I know that tendency is not determinism, but, nonetheless, it creates a deeper “moral energy well” to overcome. Ditto do some early childhood experiences. Mike, I think you just partially hoist Aristotle on a Euthyphro dilemma petard. People who don’t fall entirely into one of the three systems of system-building ethics would say that’s some sort of false dilemma. (I do.) But, if one, to fair degree, considers virtue ethics and consequentialism discontinuous, it’s an issue, isn’t it? Breathing is not taught. Swallowing is self-taught. Anything else a bit more sophisticated is taught by others. We are cultural animals. I don’t think the choice is either/or. When children are too young to understand reason one has to work with positive / negative reinforcements, then gradually move toward reasoning. Which is congruent with the Stoics’ developmental theory, as explained for instance by Cicero in De Finibus. But then one wouldn’t be teaching virtue. I think there is a contradiction lurking somewhere in your objection. Not according to the Stoics. Nor according to any naturalistic theory of virtue. And pretty much all virtue ethical systems are naturalistic. That is contradicted by a number of well established studies in developmental psychology, as well as by research on other primates. Ethology is an experimental field. It has discovered that advanced animals care, have a sense of justice, and many other sophisticated behaviors we use to attribute to humans only, etc. It was also discovered that sophisticated, virtuous human-like “instincts” are not universal: in pride of lionesses, the same particular individuals tend to do all the work. Lionesses have been observed having no maternal “””instinct”””. Other, experienced and caring lionesses had to intervene. So animals have been observed to have altruistic behaviors, or behaviors making group life possible. In other words, we don’t know what “instincts” are really made of. This will have to be determined by further ethological studies. A famous example is Lorentz’s geese. Young geese were imprinted on him being their mom, at some point of their development. Why can’t that happen for all behaviors, and all species with advanced brains? Ethology will enlighten neurology, and conversely. Both fields are just getting started. This is a very interesting line of thought that may explain psychopaths, which are people without moral capacity, theorized to be due to hereditary cause. Not only do they not learn virtue but instead simply use it as another means of manipulation, pretending to be virtuous for their own gain. Someone’s moral capacity is, all too often someone’s else atrocity. I am not trying to be slick, and an exponent of moral relativism. I actually believe human ethology entails a rather rigid sense of right and wrong. However, sophisticated logic can pervert this sense of natural right and wrong. Contemplate Orthodox Rabbis, the wisest Muslim Scholars, and the confrontation which unite them. For example some have repeated here the erroneous statement found on the Internet that Marcus Aurelius was the first emperor with a son. That’s completely false. For example Tiberius, the second emperor, had two full grown sons. Both followed the cursus honorum, and became famous generals: Germanicus reconquered the part of Germany lost by Arminius’ treachery, and in particular the locale where three legions had been lost in an ambush. What was new, is that Marcus Aurelius used a logic that brought him to make his son a “Caesar” at age five. It is not that Marcus did not know right from wrong. He did. And what he did was obviously wrong. But, somehow, Marcus found a psychopathic LOGIC to justify his perverse action. It was psychopathic logic, because it explicitly contradicted the explicit wisdom to chose the next emperor very carefully, if possible among the most meritorious youth after they received the best education (as Marcus Aurelius and Lucius Verus had been selected, and educated by the famous Grammaticus Fronto). once more, your statements are incorrect. It isn’t that Marcus was the first emperor to have a son reach adulthood, but he was the first emperor of the Nerva–Antonine dynasty dynasty who had that opportunity. And one more time: drop talk of fascism and psychopathy, it is adding nothing to the discussion. If virtue rests merely on pragmatism and our moral impulses, there can be no possible foundation for the love of the virtuous, in itself, but just its self-centered pragmatic foundation – our selfish, pragmatic concerns and our conflicted moral impulses, some crying out for revenge. What is built on an unstable foundation of change, will itself change and sink in its own mud. Please excuse my above comment. I did not wish to associate stoicism, whose values I admire, with mud. But merely still – if an idea, worldview, or religion is built on a foundation of sand (or mud), eventually it will collapse. Instead, it requires a sound and unchanging foundation. One issue here, not directly addressed by Massimo, but of course a core issue in The Republic, is: Who decides what the “correct answers” are on various moral issues, which ones are to be taught, which ones take precedence over others, etc.? This is an issue for all three traditional schools. After all, Kantians, if their ultimate moral authority is divine revelation, can always have someone claiming new revelations. Utilitarians face the issue of being unable to take a true view from nowhere, from being unable to stand behind an all-encompassing veil of ignorance. And, virtue ethicists might disagree as to which virtues best promote flourishing, as well as disagreeing on nature/nurture issues as to how pedagogy can be approached for moral education. During the Nerva-Antonine dynasty, an important qualification to become emperor was to be a stoic. Emperor Hadrian adopted in 136 CE one of the ordinary consuls of that year, Lucius Ceionius Commodus, who took the name Lucius Aelius CAESAR. Lucius did not look the most qualified, and historians suggested he was Hadrian’s natural son. After another successful consulship in 138 CE, Lucius died (of natural causes). Emperor Antoninus Pius, predecessor of Marcus Aurelius, had two natural, recognized sons: Marcus Aurelius Fulvus Antoninus and Marcus Galerius Aurelius Antoninus. However, the emperor Antoninus Pius did not name them Caesars during their childhood or adolescence. That would have been… unwise. 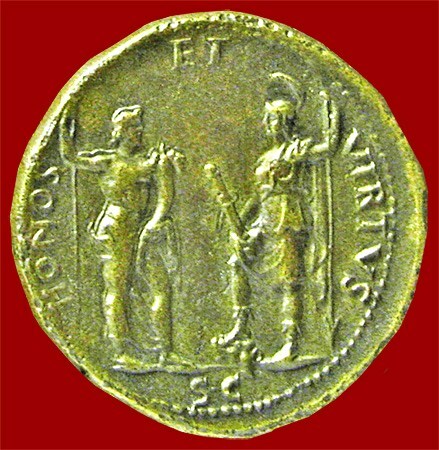 Antoninus’ two sons died young without issue. However, their sister Faustina the Younger had thirteen children, and their descendants are attested in the Fifth Century. As Antoninus had the longest reign since Augustus, he could have named a direct descendant Caesar (as Marcus would do). Antoninus was a stoic. Marcus Aurelius differed from his numerous imperial predecessors in two ways: he did not adopt a qualified, adult heir. He also nominated a very small child as heir (a royal habit which would reappear in the Fifth Century, and thereafter through the Middle Ages). I keep stating this as an axiom of moral theory, but I don’t see where it is coming from. It seems to me neither logically necessary nor supported by empirical evidence. Plenty of people try their best to be virtuous, and not just selfishly pragmatic, and yet do not believe in anything more than what you label “a foundation of mud.” Yours truly included. I’m getting a bit tired, even for a Stoic, of your apparent penchant for just making stuff up. That statement is categorically historically false, there was no such requirement or qualification to become emperor, and indeed Marcus was pretty much the only one of that dynasty to be openly Stoic.